Customer onboarding is the most crucial part of any business. The more customers you have greater the revenue you make. So how fast or how easy or how convenient a business house can make the customer onboarding process, determines how profitable that business will be. Business operating in sectors such as banking, telecom, stockbroking are required, by law, to collect supporting documents to ascertain the identity and residence of their customers. As part of the regulation, the businesses will have to collect identity proof, photo, address proof, income proof, PAN etc from the customer before they can provide the service. Most of the time it is too much trouble for the customer to get the copy/original of all the required documents that they might drop the idea of opening the account. Imagine onboarding a customer who is just spending his leisure time in a shopping mall. The earlier only thing the salesperson can do is, to hand over a leaflet and try talking. Even if he convinces the prospect, he can't make the prospect take an action as paperwork is too complex to do then and there. Moreover, the prospect may not be carrying any ID proof or photo or any other supporting document needed to complete the customer onboarding process. 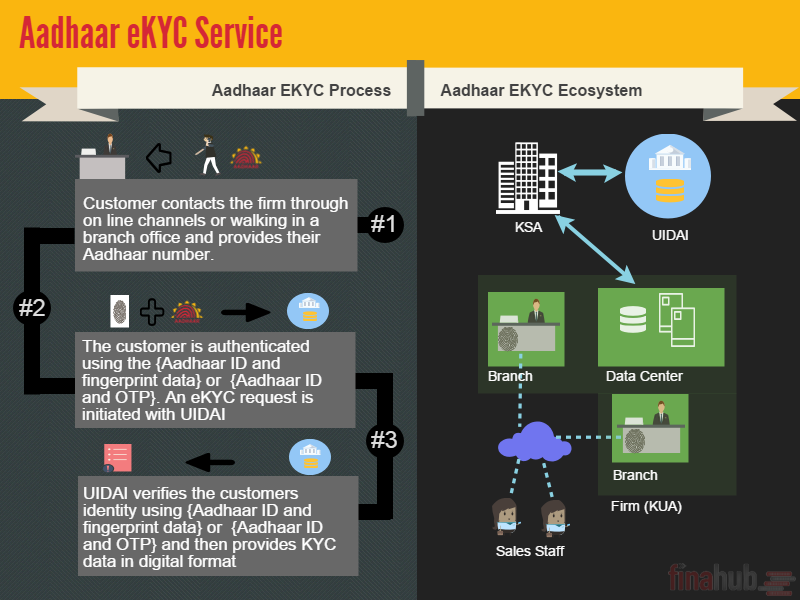 Finahub's Paperless Customer onboarding solution address uses Aadhaar EKYC and Aadhaar eSign service addresses this problem head-on. Our customer onboarding service can make your sales team 100% more efficient. Details are below. 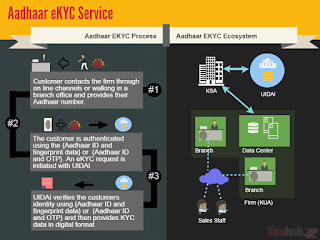 Finahub Aadhaar eKYC enables banks, NBFCs, stockbroking firms and other financial organizations to get KYC data of their customers from the Aadhaar database in electronic format in a secure manner. The data is pre-verified and digitally signed enabling onboarding customers without paperwork. 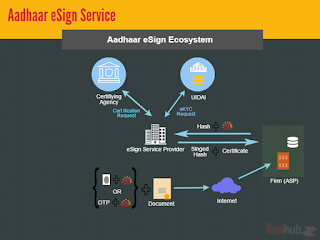 Aadhaar eSign is Govt of India approved digital signing service that uses Aadhaar Authentication to electronically sign documents. 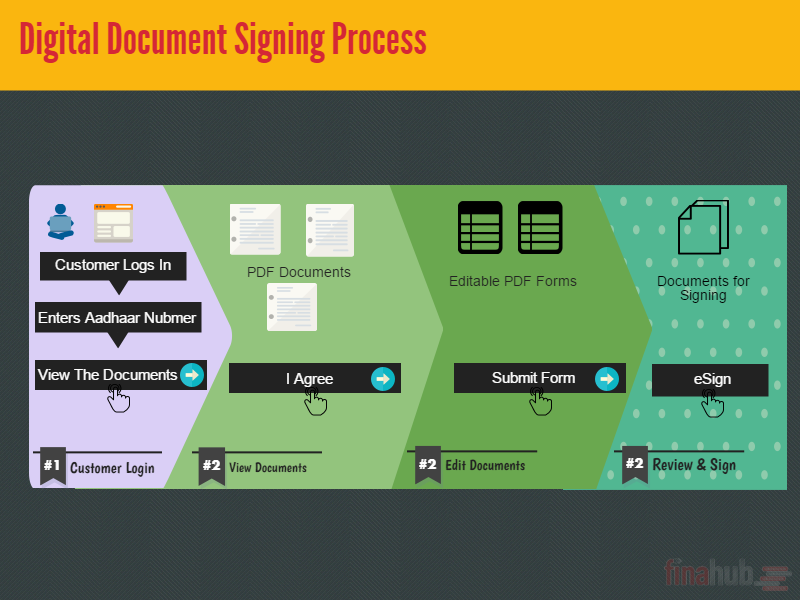 The service can be used by banks, NBFCs, stockbroking firms and other financial organizations to digitally collect signed supporting documents that required to perform their transactions. 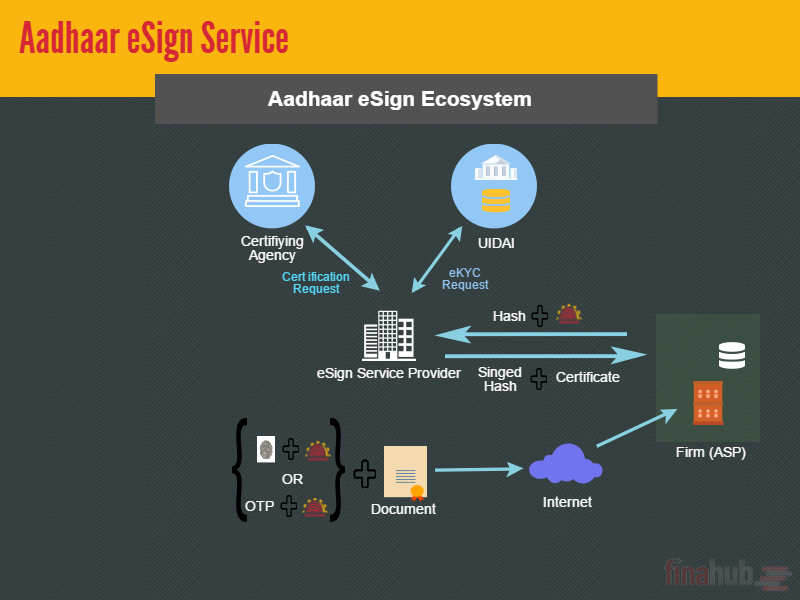 eSign can be used by any Aadhaar card holder for digital signature without using any additional software. 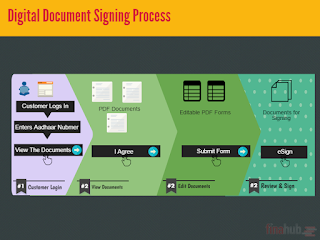 The predefined customer onboarding wizard takes the customer through a set of easy steps to get self-signed digital versions of the supporting documents. The service can be easily deployed as an online service or a mobile solution enabling both customer serf service onboarding process as well as agent assisted processes. If you have any quires on implementation paperless customer onboarding or Aadhaar eKYC at your organization, do let us know. We will be more than happy to help you out.